이정숙, 구형선, 조인주,(2013).대학생의 성장기 아동학대 경험이 우울에 미치는 영향의 구조적 관계 분석 .정신보건과 사회사업,41(1),143-168. 본 연구는 대학생들이 성장기에 부모로부터 받은 아동학대 경험이 우울에 영향을 미치는 관계에서 가족지지, 친구지지, 자아정체감의 매개효과를 규명하고자 하였다. 이를 위해 선행연구를 토대로 연구모형을 설정하고, 구조방정식 분석을 통해 경로과정을 검증하였 다. 본 연구의 대상은 전북지역 5개 대학교에 재학 중인 대학생들로 설문조사에 응답한 총 1,329명의 설문 자료가 최종 분석에 사용되었다. 구조방정식 분석 결과, 본 연구를 위해 수립한 측정모형과 구조모형이 모두 료에 적절한 모형 적합도를 보였다. 연구모 형에서 수립한 다양한 경로들 가운데 아동학대 경험은 우울에 직접적인 영향을 미치는 것으로 나타났다. 또한, 아동학대 경험은 가족지지, 친구지지, 자아정체감을 통해 우울 에 간접적으로 영향을 미치는 것으로 나타났으나, 아동학대 경험이 친구지지와 자아정체 감 각각에 직접적인 영향은 미치지 않았다. 한편, 가족지지는 친구지지에 영향을 미쳤지 만, 친구지지가 우울에 이르는 경로는 유의미하지 않았다. 본 연구의 결과를 토대로 대학 생들의 정신건강 증진을 위한 실천적 함의와 후속 연구를 위한 과제를 제시하였다. This study aimed to examine pathways among child abuse experience, family support, friend support and self-identity on depression in college students. Based on the existing literature on this topic, we specified a research model and tested hypothesized paths on depression using structural equation modeling. 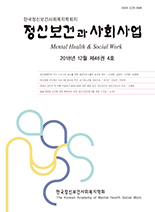 A survey data of 1,329 college students residing in Jeonbuk area was used for this study. The analysis results showed that both measurement and structural models had a good fit to the data. Among many hypothesized paths in our research model, child abuse experience by father and mother had significant direct effects on depression in college students. Also, child abuse experience by father and mother had significant indirect effects on depression through family support, friend support, self-identity. However, the path from child abuse experience by father and mother to friend support and to self-identity, respectively, was not significant. The path from family support to friend support was significant, but the path from friend support to depression was not significant. Based on the study findings, implications for practice to improve mental health of college students and for future studies were discussed.